A new pilot program is coming to Brooklyn and Queens that hopes to reduce traffic congestion by banning curbside parking and loading during peak hours (7am-10am; 4pm-7pm). The Clear Curbs program aims to clear delivery trucks who double park and idle in traffic lanes during rush hour. The city will collect data on congestion, double parking, and delivery activity to determine whether or not to make the program permanent and expand it to other locations. 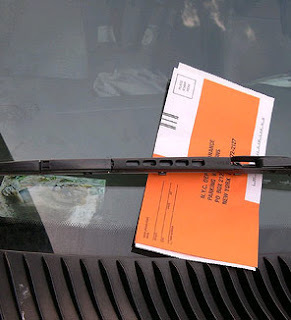 Last week, Mayor DeBlasio promised to crack down on illegal abuse stemming from the additional 50,000 parking placards issued to city school employees. According to Streetsblog, there are almost 150,000 official placards, but also an unknown number of counterfeit placards. An anonymous Twitter account @placardabuse documents vehicles parking in a variety of illegal ways. The NYPD stated that they would hire an additional 100 ticket agents and add 16 police officers to a placard fraud enhancement unit. The mayor also pledged new technology that would be able to scan license plates for placard abuse. The city also promised better monitoring of 311 complaints, @placardabuse, and other relevant online sites to stay on top of the problem. However, several days after Mayor DeBlasio made these statements, CBS News found that there were still vehicles parking illegally outside of city schools, as shown in the video above. Did you know that some of the No Parking Department of Transportation signs you see around NYC were not actually put there by the city? According to a story by ABC News, the No Parking signs with the orange DOT tags are actually sold by the city to construction companies who do not always install the signs where a No Parking regulation actually exists. Senator Daniel Squadron, (D) Brooklyn, is calling for oversight following an investigation into the problematic signage. Transportation Commissioner Polly Trottenberg said the city is looking into parking policy reforms, and smarter delivery practices. MTA CFO Michael Chubak explained declining bus ridership as being caused by riders switching to parallel subway lines, but did not have any updates on improving bus service and reliability. He also said the agency had never explored the possibility of using the MTA's real time GPS system to reduce bus bunching, to which Council Member David Greenfield responded, "You have the technology to actually make sure that bus bunching doesn't occur." Mayor de Blasio has stated previously that the City will not fund half priced MetroCards for low income residents, believing the state should cover the cost because the MTA is a state agency. The MTA however, believes the City is responsible for the cost, with Chubak stating, "It's really a social services question. We don't think it's a decision for the MTA to make. It's really a question of social policy, which would need to be made by New York City." According to CBS News, a parking spot in Park Slope is up for sale for $300,000. The spot is being listed as a condominium on Brown Harris Stevens real estate. Along with a place to park the car, the spot comes with a garage valet and hand-washing... at an additional charge. According to Newsday, Mayor Bill de Blasio does not support congestion pricing for Manhattan, and said it's "not part of my vision." While other major cities, such as London, Singapore, and Stockholm, have had success using such pricing programs, Albany has yet to support such a plan.